this eggless mango cheesecake recipe is a no bake vegetarian mango cheese cake recipe made without eggs and gelatin. 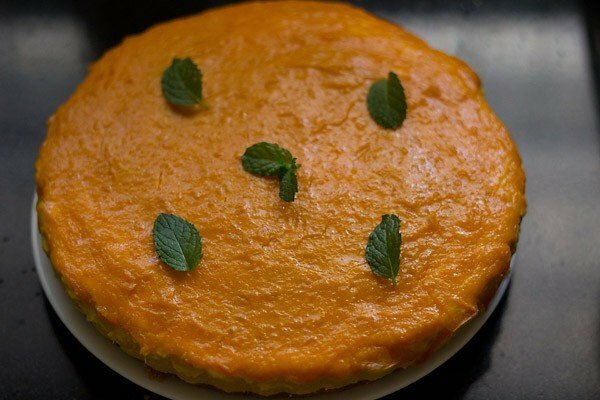 mango cheesecake recipe with step by step photos – this is a delicious no bake vegetarian mango cheese cake recipe made without eggs and gelatin. i have made this cake thrice in this mango season. 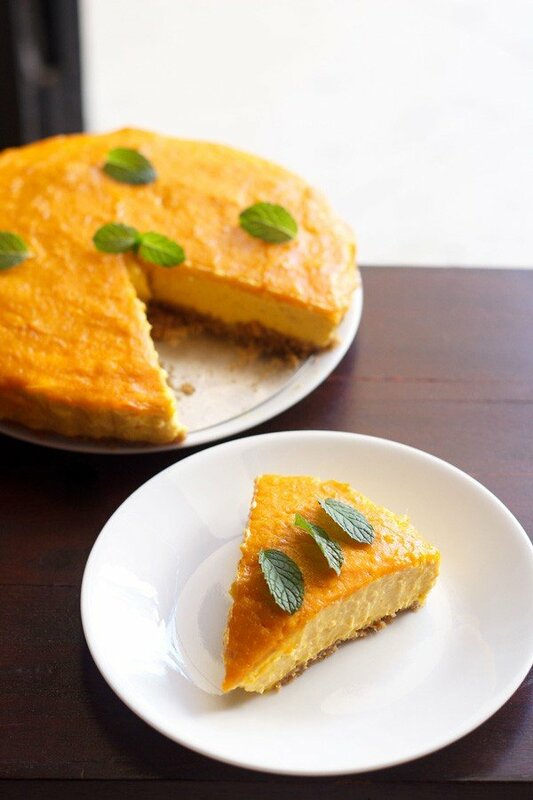 one of the favorite mango desserts at home and no wonder i end up making this delicious cheesecake. 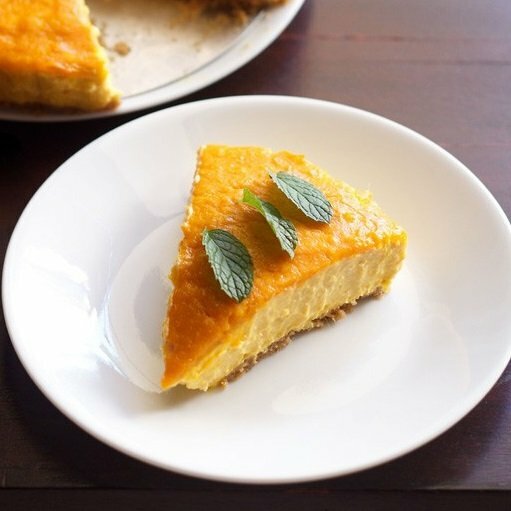 the mango cheesecake recipe is without eggs, gelatin and a no bake version. i will not say making this mango cheesecake is a breeze. no it is not. 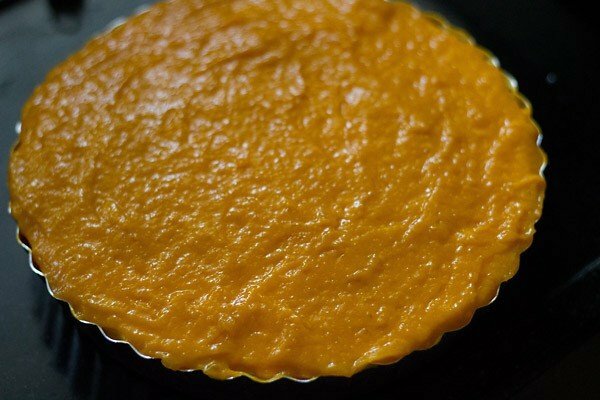 you have to spend some time prepping up like making the mango puree (if using fresh mangoes), the agar agar solution, and the cream cheese mixture. go step wise and methodically so that things are easy. as always i will suggest to use fresh sweet mangoes to make this cheesecake and not canned mango pulp. the cheesecake does not have a smooth & silken appearance because i have not heated the mango puree while adding the hot agar agar solution. we do not like the taste of cooked mango puree in a dessert. the taste of this cheesecake is damn good though. so if you want a silken looking mango cheesecake, then just heat through the mango puree and add the hot agar agar solution to it. stir and then add half of this mango puree to the cream cheese mixture. 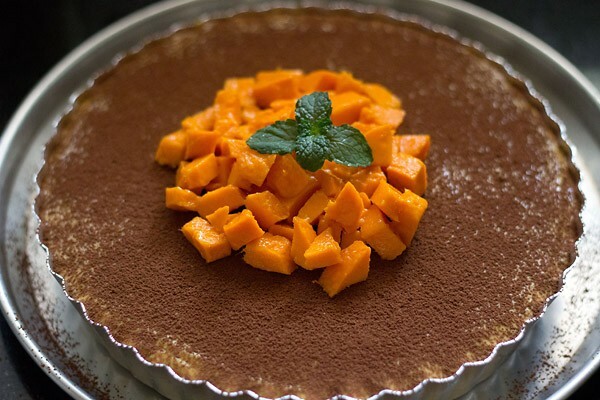 if you want to taste the freshness and sweetness of mangoes as it is and do not bother about the look, then make this recipe. i have made the cheesecake both with cream crackers and whole wheat marie biscuits. both taste good. 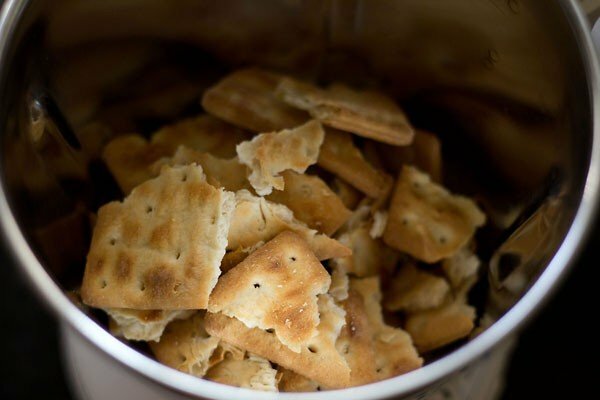 you can also use your choice of crackers or biscuits. use a good quality cream cheese. i have added philadelphia cream cheese, which is available in most metros. for the cream i have used amul cream. if making the cheese cake for the first time, then i would suggest you to use glasses or bowls, so that you can just make the layers in them. removing the cheesecake from the pan is a bit tricky. the pan also has to be a detachable one (shown in step by step pics). the mango cheesecake served in individual bowls or glasses, look pleasing as well as easy to serve (mentioned in the notes section below). 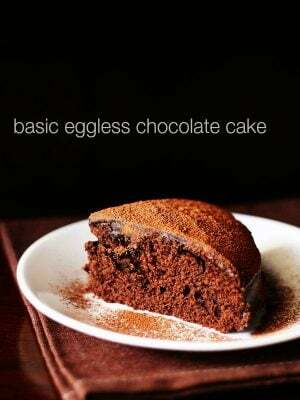 if you are looking for more eggless cakes recipes then do check pineapple cream cake, strawberry cream cake, eggless mawa cake, whole wheat pound cake and eggless banana cake recipe. break the biscuits and add them to a food processor or a dry grinder and powder them. add cinnamon powder and honey or butter and just blend them once more till the honey/butter is evenly mixed. grease a detachable pie pan bottom with unsalted butter. 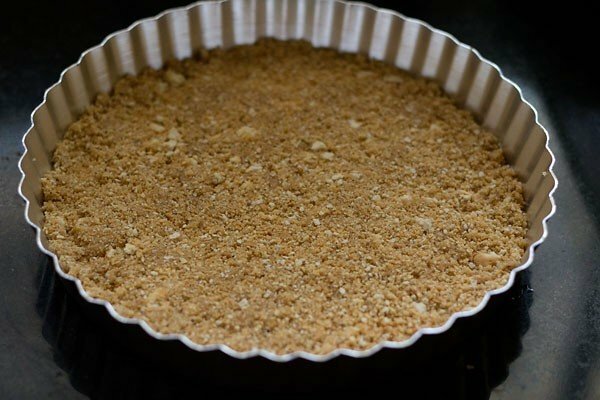 place the powdered crackers/biscuits on the pie pan and with your fingertips just press them and make an even layer. keep in the fridge for about 15 to 20 mins for the bottom crumb layer to set. cut the agar agar sticks and soak them in 1/2 cup of water for 20 to 25 mins in a small pan. peel and chop the mangoes. 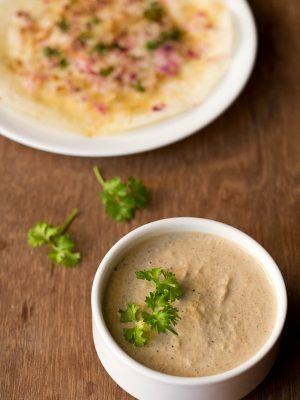 prepare a smooth puree of the chopped mangoes in a blender. 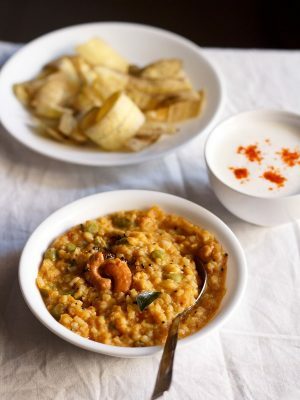 divide the mango puree into two equal portions in separate bowls and keep aside. in a another mixing bowl or pan, take the cream cheese, cream, vanilla extract and sugar. 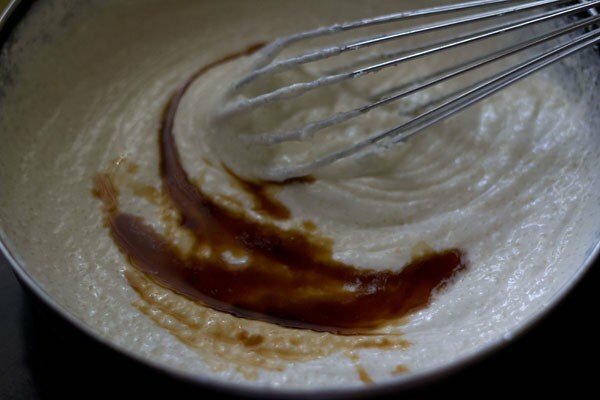 with a wired whisk whip this mixture very well till smooth. you can also use a stand mixer or a hand held mixer or food processor. then add half of of the mango puree (i had 1 cup of mango puree) and gently mix it with the cream cheese mixture. now heat the pan containing the agar agar and water on a sim or low flame. 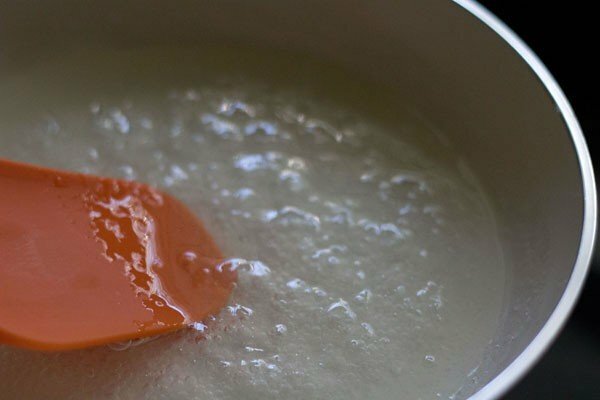 keep on stirring and cook this mixture till the agar agar dissolves completely in the water and you see a smooth gelatinous liquid. when the agar agar solution becomes warm, take equal portions of it. 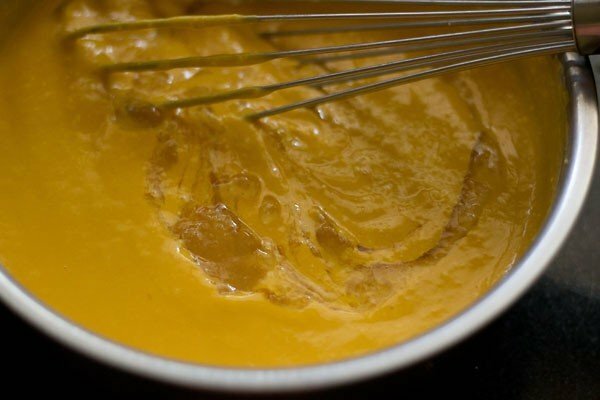 add one portion of the warm agar agar solution to the mango cream cheese mixture and stir quickly and vigorously. add the remaining half portion to the mango puree and again stir quickly. 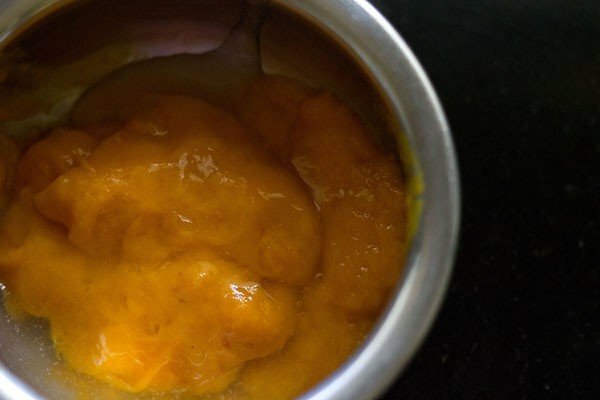 if the mangoes are not sweet, then do add some sugar to this half of the mango puree before you add the agar agar solution. in case, the agar agar solidifies, then reheat it again adding some water. you can also keep it on a hot water bath to melt it again. pour the mango cream cheese mixture on to the cracker crumb layer. shake the pan gently to spread even the cream cheese. with a spatula even the second mango cheese cake layer. 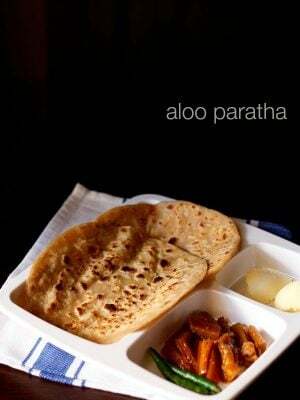 keep the pan in the fridge for about 30 to 35 mins. remove and then layer the mango + agar agar mixture gently on the middle cream cheese layer. with a flat spatula spread the last layer carefully. 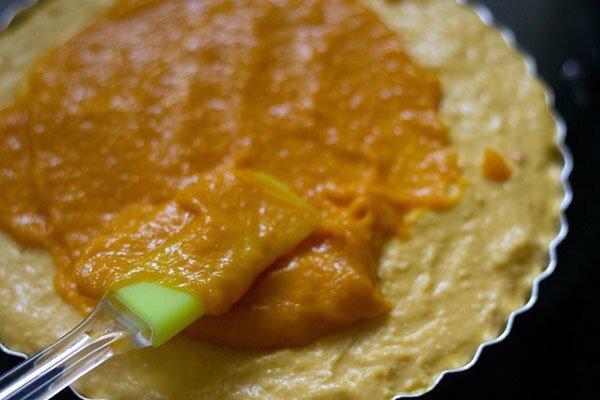 if the mango puree has become thick with the agar agar setting in it, then just lightly microwave it. 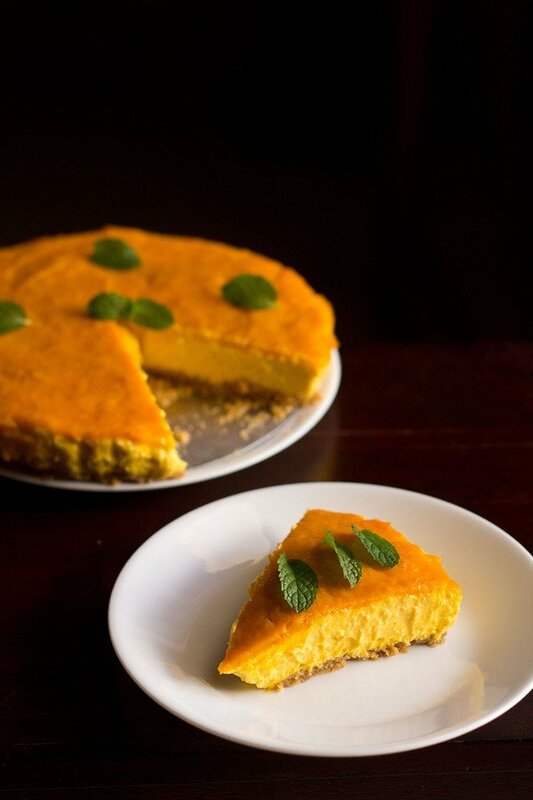 cover the pan and keep in the refrigerator for the mango cheese cake to set for 3 to 4 hours. unmould carefully and then place the cheesecake on a serving tray or plate or cake stand. decorate with whipped cream, chopped mangoes, mint leaves or whatever you prefer. slice the mango cheese cake and serve immediately. if you want a silken looking mango cheesecake, then just heat gently through the mango puree and add the hot agar agar solution to it. stir and then add half of this mango puree to the cream cheese mixture. the remaining half you keep aside and then use it to make the top most layer. 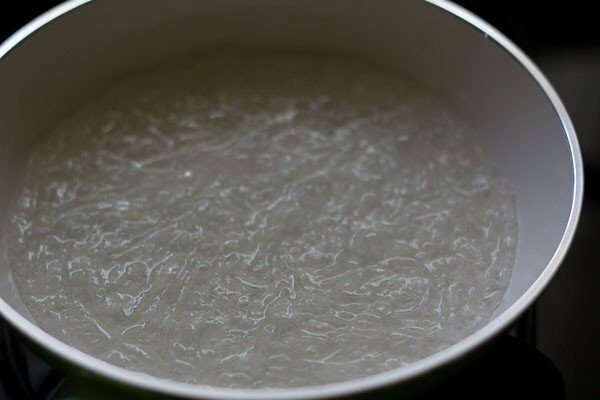 if the agar agar solution solidifies, then reheat it again adding some water or melt on a hot water bath. if you want to make just a two layer cheesecake, then add the entire mango puree to the cream cheese, cream, sugar mixture. also add the entire amount of agar agar solution when it becomes warm to the mango cheese cake mixture. 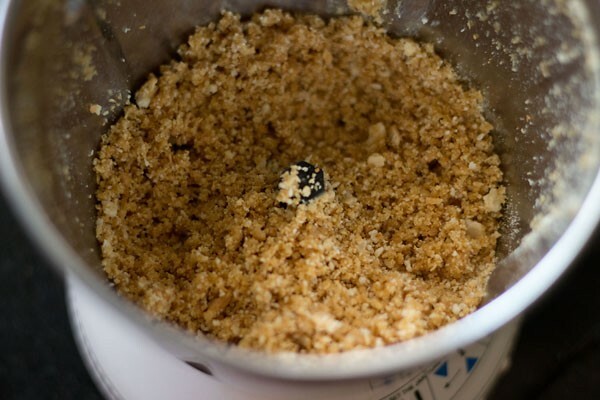 for making the cheesecake in serving glasses or bowls, first layer with the cracker crumb layer. set for 10 mins in the fridge. then add the mango cream cheese layer in the glasses/bowls. allow to set for 15 to 20 mins. 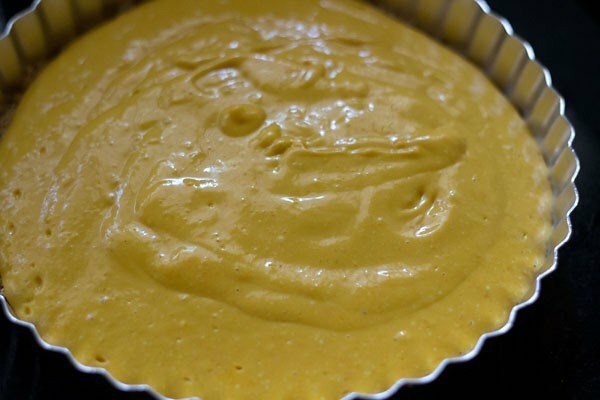 then add the mango puree layer and keep to set for 2 to 3 hours. 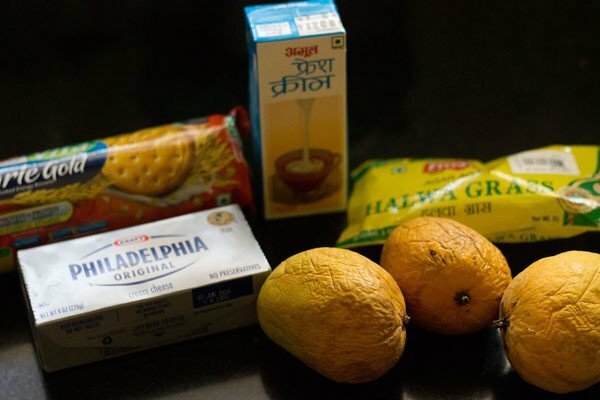 1. below the ingredients required – in anti clock wise order from left – biscuits, cream cheese, mangoes, agar agar and amul cream. 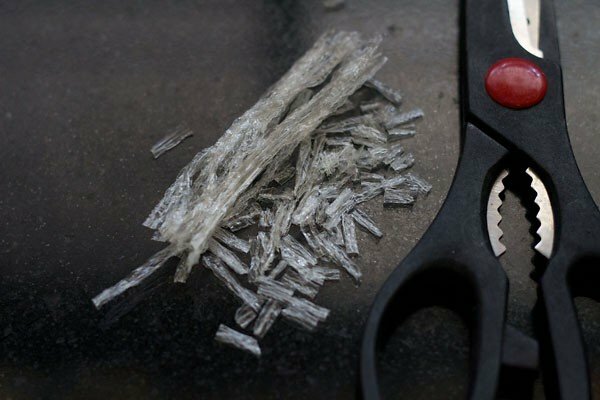 2. cut the agar agar strands with kitchen scissors to small pieces. 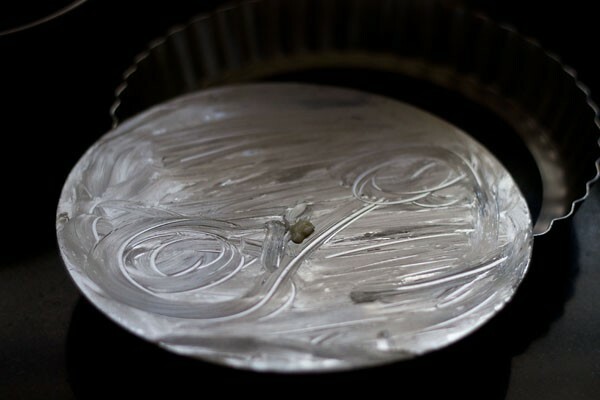 3. soak the agar agar pieces in water for 25 to 30 mins. 4. meanwhile break the crackers or biscuits in a dry grinder or blender or food processor. grind to a fine powder. a slight coarse consistency is also alright. 5. add cinnamon powder and honey. 6. blend till the honey mixes well. scrape with a spoon or spatula if required. 7. grease the base of the pan with butter. this is a pie pan with a detachable base. skip this step if you are using individual bowls or glasses. 8. place the powdered cracker or biscuits on the greased pan base. spread the layer evenly with a spoon or spatula and with your finger tips press the layer. keep this layer in the fridge for it to set for about 15 mins. 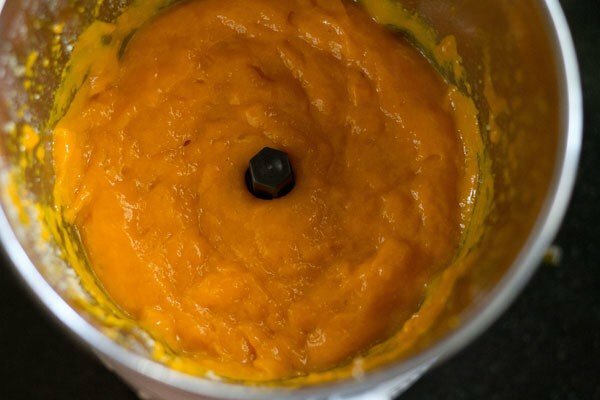 9. prepare the mango puree in a blender. 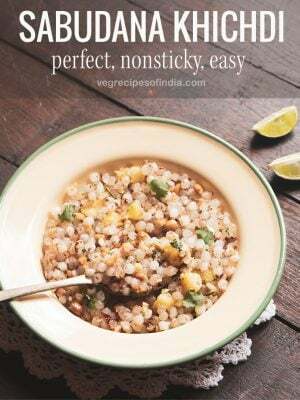 divide the mango puree into two equal portions in separate bowls and keep aside. 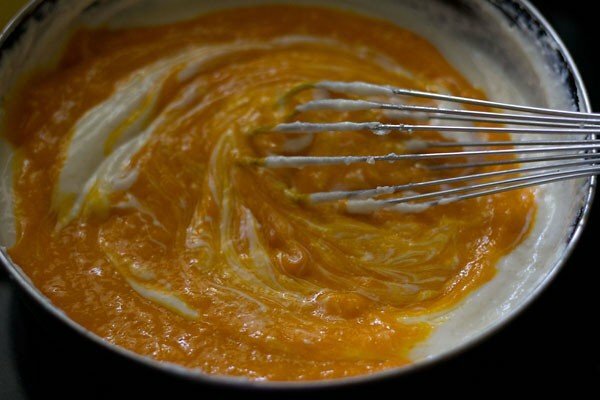 11. add half of the mango puree to the whipped cream cheese mixture. mix very well. 12.now heat the pan containing the agar agar and water on a sim or low flame. keep on stirring and cook this mixture till the agar agar dissolves in the water and you see a smooth gelatinous liquid. 13. when the agar agar solution becomes warm, add half of it to the mango cream cheese mixture and stir quickly and vigorously. 14. add another half of the agar agar solution to the remaining half of the mango puree and stir quickly. keep aside. 15. pour the mango cream cheese mixture on the base cracker layer. shake the pan gently to spread the cream cheese. with a spatula even mango cream cheese layer. 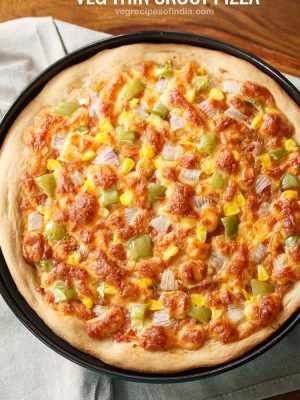 16. keep the pan again in the fridge for about 30 to 35 mins for the second layer to set a bit. then with a spatula spread the remaining mango+agar agar mixture very gently on the cream cheese layer without disturbing it. 17. here’s the mango cheese cake before going into the refrigerator. refrigerate for 3 to 4 hours till the cheesecake is set. 18. this is mango cheesecake set and done, the next day. gently remove the base on a cake stand or on a serving plate.this one is just topped with some mint leaves. 19. you can decorate the cheesecake with chopped mangoes, chocolate shavings, whipped cream or anything that you and your family prefers. 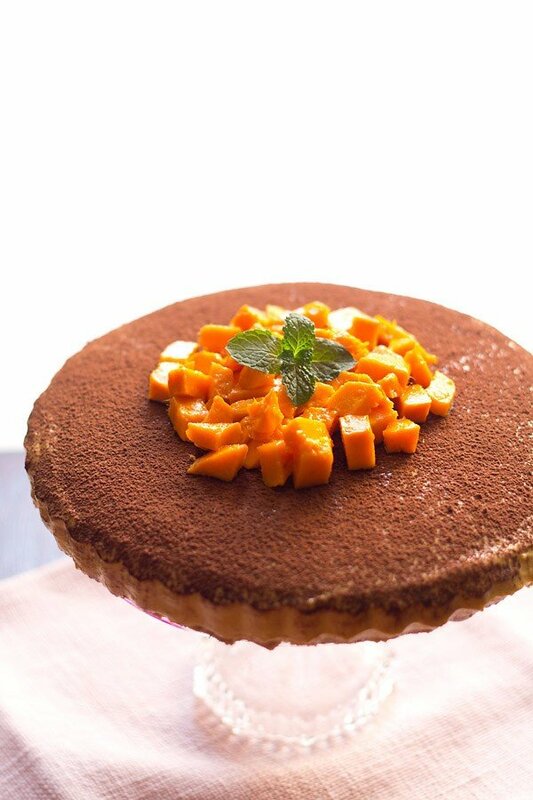 the one in the pic below has cocoa powder sprinkled with chopped mangoes and a touch of mint leaves in the center. 20. slice the mango cheese cake and serve immediately. for more delicious mango recipes you can check this collection of 41 mango recipes. 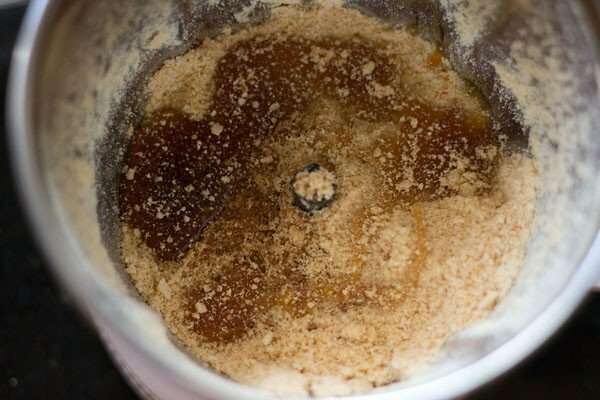 How can I modify this recipe if I am using agar agar powder instead of the strands? ranjani, you can use 3 to 3.5 teaspoons of agar agar powder or roughly 1 tablespoon. i have mentioned it in the ingredient section which you may have missed. have already replied to you query maha. please check the comment below. and thanks for the lovely feedback. I have spare packets of agar agar and wish to use them. 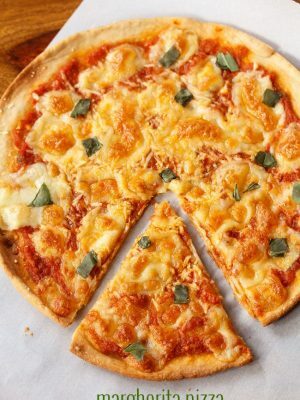 Can you tell me other recipes for which i may use it?. Thanks in advance. I’m an amateur at desserts (I’m 14). I’ve tried a lot of your recipes and they turned out fabulous. But today, something went wrong with this. I used gelatine instead of Agar Agar powder else everything was same and the cake isn’t setting. Can you please guide me to where i might have gone wrong. sayanee, with gelatin the proportion will change. i am not sure exactly how much gelatin to add as i have not used it in this recipe. since the cheesecake has not set, it means that the gelatin amount was less. if more had been added, it would have set well. hope this helps. Thank you so much for this recipe. I tried it out and its amazing. Your site is always my website for recipes and invariably it turns out fine. Keep up the good work!! and thanks again. 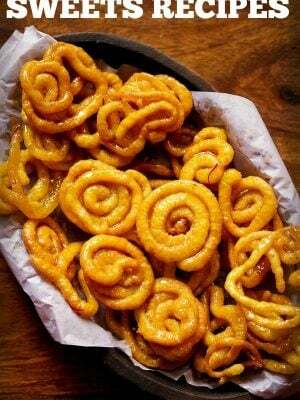 Welcome Maha. Thanks for sharing your positive feedback on recipes.